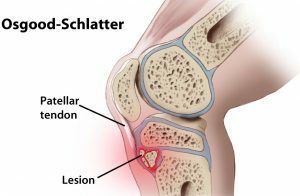 If you are a pre-adolescent and have pain at the upper part of your shinbone that comes and goes during the day and that wakes you up at night, then you may have a condition called Osgood-Schlatter Disease (OSD). 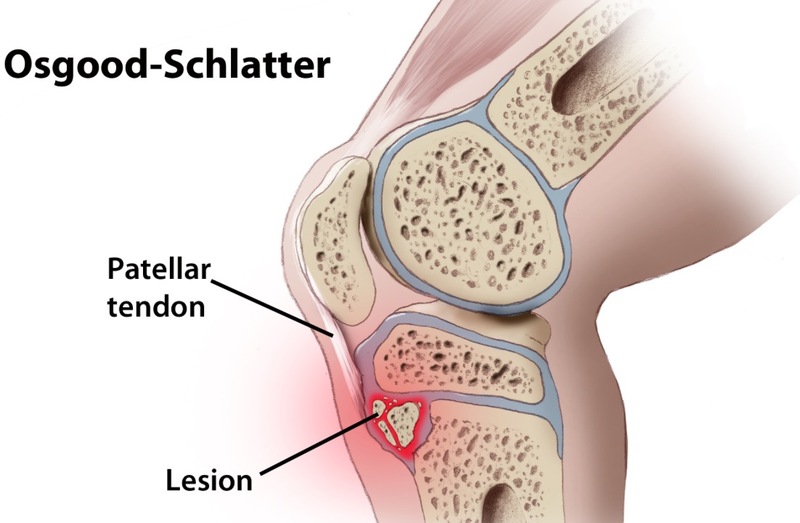 Osgood-Schlatter Disease is an inflammation of the area just below the knee where the tendon from the kneecap (patellar tendon) attaches to the shinbone (tibia). OSD results from repeated knee extensor contraction of the patellar tendon at its insertion on the tibial tubercle. The traction can cause strain at the skeletally immature tibial tubercle during rapid skeletal growth spurts. Studies have found that OSD can affect anywhere from 4% to 20% of athletic adolescents. Female 8-12 years & males between 12-15 years who are involved in repetitive sprinting and jumping sports are at greatest risk. Symptoms include frontal knee pain and tenderness at the tibial tubercle, swelling at the tibial tubercle, and tight muscles in the front or back of the thigh. In some cases, both knees have symptoms, although one knee may be worse than the other. Patients usually report that the knee pain occurs during activities such as running, jumping, squatting, and ascending or descending stairs. Pain often subsides with rest. The patient’s history of pain at the tibial tubercle and a physical examination showing point tenderness at the tibial tubercle is usually sufficient to make the diagnosis of OSD. A lateral X-ray may reveal radiodense fragments or ossicles separated from the tibial tuberosity. Ultrasound may show a normal tubercle and signal changes consistent with thickening of the patellar tendon. Nuclear Medicine Bone Scan may demonstrate increased uptake in the area of the tibial tuberosity. Computed tomography (CT) scanning or magnetic resonance imaging (MRI) may reveal changes at the insertion of the patellar tendon. Activity modification: Avoid activities that cause the pain, including running, jumping, squatting, and ascending or descending stairs. Ice: Application of ice for 20 minutes every 2-4 hours can help to reduce the pain and swelling at the tibial tubercle. Anti-inflammatory Medication: Medications like Advil®, Motrin®, Ibuprofen, and Aleve® can help to reduce the pain and swelling at the tibial tubercle. Please use these medication as directed on the package. You should eat something when taking these medications as you may be at risk for an ulcer in the stomach if you take them alone. If you tolerate these drugs well, then take it daily for two weeks and then discontinue for one week. If symptoms worsen or return, resume for two weeks, and then stop use of these medications. Physical Therapy: Quadriceps/hamstring stretching and strengthening may help relieve pain and prevent the disease from returning. Infrapatellar strap, pads, or braces: May be used for support, but none have any proven efficacy. Long-term immobilization: Not recommended as it may result in increased knee stiffness and predispose the athlete to additional sports-related injuries. Local steroid injection: Not recommended as it may result in increased risk of weakening the patella tendon enough to cause rupture. Surgery: Not recommended as removal of ossicle fragmentation in immature patients with an unfused apophysis can lead to premature fusion of the tibial tubercle, in addition to the potential complications of wound dehiscence/ infection. The prognosis in Osgood-Schlatter disease (OSD) is excellent. OSD is usually self-limiting and resolves by the time the patient is aged 18 years when the tibial tubercle apophysis ossifies.